Even if you’ve never owned a horse, you may have considered the feasibility of using horses for prepping and survival purposes. Horses are definitely worth considering as part of you prepping and survival planning, especially when gasoline is scarce or an EMP knocks out your car. But you can’t just go out and buy a couple of horses you like the looks of and hope for the best when SHTF. Horses, like any other animal, have different personalities, traits, and behaviors that work together to make them either an asset or a liability on your homestead or farm and when you need to rely on them for survival purposes. So before you run out and buy a couple horses for prepping and survival purposes, here’s what you need to know. First, what tasks or chores do you want your horses to be able to do on a daily basis? Secondly, what kind of tasks will you depend on them for when SHTF? Answering these two questions will help you to choose the right horses to make the implementation of your survival plan successful. Riding a horse can allow you to travel through wooded areas and over rougher terrain than a car or even an ATV. Staying off the main roads and away from crowds of desperate people can help keep you and your family safer and increase your odds of getting to your bug out location. Horses can also be used to carry children, elderly, disabled, or injured group members during a bug out trip. The right horse, when properly trained, is great for bug out transportation because they don’t need gasoline to keep moving. Horses eat grass that is readily available along the way unless it’s winter, but even then, they can carry their own grain. As long as your horse is properly cared for, trained to be reliable, and you are paying attention, you won’t need to worry about it breaking down like a vehicle. The average horse can carry up to 20% of their body weight which means about 150-450 lbs depending on the weight and breed of the horse. If you have to bug out without your car or need to scavenge for supplies following an EMP, horses can haul extra supplies in saddle bags or can be trained to pull a cart or wagon loaded with supplies. Having a horse carry bug out supplies and to ride part or all of the way sure beats bugging out on foot for fifty miles. Around the farm and homestead, horses can be very useful and they make great companions. When SHTF, fuel for a tractor or other heavy equipment you use to get things done will be in short supply. Horses can be used to accomplish many heavy duty hauling or towing tasks such as pulling out tree stumps, hauling downed trees from the woods to the log splitter, moving fence posts, or lifting roof trusses, etc. With proper training, a horse can even help you pull a trapped calf or other livestock out of the mud or ravine, or help you pack out that large game animal you were lucky enough to find on your hunting trip. Horses can save you a lot of time and back breaking work in the garden by pulling a plow or till to the get ground ready for planting. They also can come in handy for hauling soil, or harvesting and hauling crops, like hay and corn, to where it will be stored. Horse manure can also be composted and used to enhance garden soil so your plants grow better and produce more food. Once you’ve decided which tasks you want your horses to be able to help you with, you need to choose the breed of horse with the best combination of characteristics and traits needed for those tasks. Choosing the best horses is critical. Asking a horse to repeatedly do a task that they just aren’t physically or emotionally built for can cause the animal undue stress and could spell disaster for you and your family if the horse stresses out and fails to perform in a survival situation. Hot bloods are in the lightweight category as far as build. They have been bred for speed and stamina rather than brute strength. Hot bloods are high-energy, can be prone to excitability, and can be easily agitated or “flighty”. Thoroughbreds and Arabian breeds are generally in this category. Training can help with excitability and flightiness and if trained right, some hot bloods would make very good horses for preppers. Warmbloods are the middleweight category of horses. The breeds in this category descended from a mix of draft horses and hot bloods but are not a direct cross. Warmbloods were bred for agricultural work initially but cross bred for athletic/sport abilities. Horses in this category tend to naturally excel at jumping, dressage, eventing, and driving. Hanoverian, Trakhener, Dutch Warmblood, and Holsteiner breeds are generally in this category. They do have wider legs that allow them to carry their own weight plus a rider and pull something, like a cart, for example. Light horses vary in size, color, and shape. These horses are bred for agility, speed, and endurance. 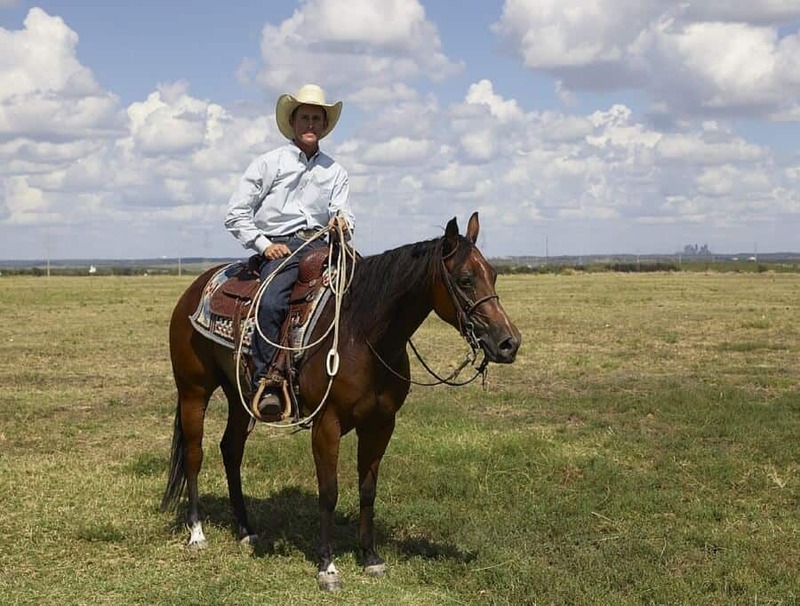 Sometimes referred to as “stock horses” they are a great choice for those wanting to ride for enjoyment as well as those who want a daily “working” horse. The popular American Quarter Horse is in this category as well as the Appaloosa, Morgans, Paints, Polo ponies, and Pintos. Coldbloods (Draft horses) are the tall, over 16 hands (64 inches or 5.3 feet) and are heavyweight of the horse world, weighing in at more than 1600 pounds. Typically calm and unflappable, they are strong, with the ability to pull more than double their weight in spurts. Clydesdales, Belgians, Percheron, Shire, and Suffolk breeds are in this category. Ponies aren’t just baby horses. Full grown ponies are less than 14.2 hands (56.8 inches tall). The temperament of a pony can vary greatly. If you are looking for a pony for your child, make sure you spend a fair amount of time with the pony to get a good feel for its temperament and personality. Some ponies can be unflappable, others can get quite spirited and stubborn. Kids can ride a pony up until their legs hang below the belly of the pony or until their weight becomes too heavy. Some ponies can be taught to pull cart with a rider in it and historically ponies were bred to do all kinds of tasks. Miniature Horses are no taller than 34 inches. They come in similar colors and temperaments as full size horses and unlike ponies, they really mini versions of full size horses. The advantage of mini horses for prepping and survival purposes is that they eat quite a bit less than a full size horse which means they need less pasture for grazing. Miniatures are typically strong and could easily carry up to about 20-40 pounds of supplies on their back. The real benefit of miniature horses is the fact that they are able to pull approximately 2 times their body weight on smooth terrain. This means a miniature could really come in handy for supply runs or a bug out trip if trained and conditioned to pull a cart or wagon. Non-horse equines include donkeys, mules (horse/donkey cross), and even zebras. They can breed with horses but are not horses themselves. They are generally stronger than their size would indicate, very steady on their feet, and you can ride them or use them to carry excess supplies. They also make great guard animals for sheep and cattle as they will attack dogs or coyotes. They are typically good tempered but can be extremely stubborn. As you can see from the above descriptions, the temperament of a horse is a very important thing to consider when buying a horse. It becomes even more critical if you are buying horses for prepping and survival purposes.. Although horses of the same breed typically align as far as temperament and other characteristics, there are always exceptions to every rule. Many horses can be trained and desensitized when it comes to their environment but since things are so unpredictable in a SHTF situation, that a natural unflappable temperament in a horse is very helpful. Speed and stamina of a horse is also a consideration. It’s especially important if you plan to use your horse for bug out transportation as you may have to outrun looters or other people desperate for what you have. Some horses can go very fast for only short distances, while others can go longer distances at a slower pace. Just make sure you know and respect the physical limitations of your horse. The average horse can move about twenty-five miles per hour at a full run. But many horses aren’t made to run full speed for long distances. After a couple miles at full speed, sometimes sooner, your horse will be wiped out, so don’t push it that far unless your life depends on it. Horses bred for racing, such as thoroughbreds, who are slender and lighter, may tend to run faster. Draft horses, Percherons, and Quarter horses are naturally slower due to their size and musculature. Certain breeds of horses are just naturally faster than others. A horse’s speed can also greatly depend on their physical health and conditioning and the type of terrain they are running on. Strength of a horse, especially if you plan to use them for prepping and survival tasks, is definitely something to consider. If you plan to regularly use your horse for tasks that require brute strength such as towing or hauling over distances, carrying more than a couple hundred pounds routinely, etc., you’ll want to get a horse that is built for these tasks. As a rule, larger horses such as Draft horses or Quarter horses have more natural strength. Donkeys as a breed are generally strong, even though they are small. But again, there are always exceptions. Maintenance level of a horse is also a consideration. Buying a horse is a huge commitment of time and money but it can really pay off in a SHTF scenario. Horses need proper care in order to stay healthy. Food, water, proper foot care, healthcare, and proper shelter are all important when it comes to keeping your horse in peak physical condition. Like with any other animal, some breeds of horses are inclined to specific health problems. Buying a horse at an auction is NOT recommended unless you or someone with you is skilled in identifying potential health problems which can sometimes be masked by the seller. It’s important to know what these are so you can choose the best horse for your needs and head off any health problems before they occur. No matter which horse you choose, it’s important to thoroughly understand what goes into the care and protection of your horses. Owning horses is a commitment and it takes work and effort to make sure they are as healthy as they can be but having a healthy, well-trained horse to rely on when SHTF will be worth it. 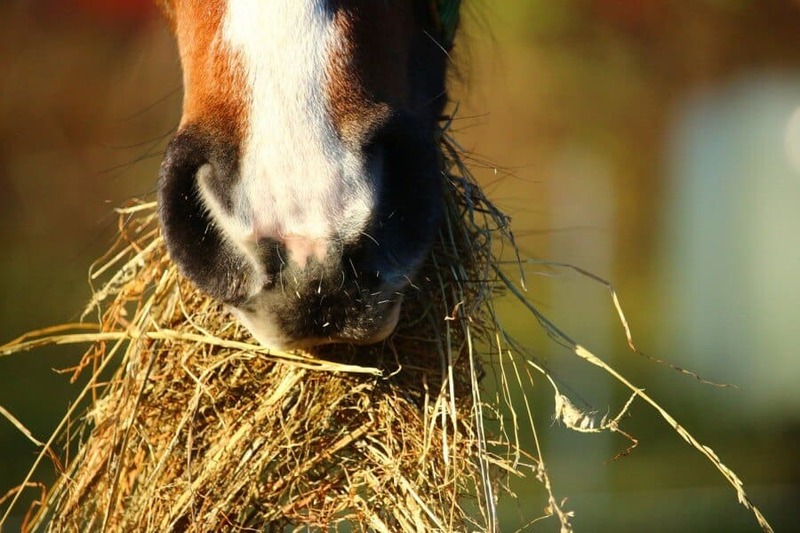 Most of a horse’s diet comes from forage material. This means grass from the pasture and hay. You can choose to grow your own hay if you have the space and desire or you can purchase hay from others. Hay comes in various forms including square and round bales, pellets, and cubes. If horses are left to their own devices, they will get into grain bags. It’s your responsibility to keep all feed locked in airtight containers that your horse cannot open. It only takes one time for your horse to get into grain and they can get colic, something they may not recover from. Horses also love fresh fruits and vegetables. Apples and carrots are the most common, but I’ve seen horses eat pears, beats, and even oranges. Sugar cubes are a great treat. A salt lick block can help keep your horse from getting board. I’ve heard of horses that eat vanilla wafer cookies or drink orange juice. It really just depends on your horse and again, everything in moderation. Your horses feet and legs are their lifeline in every way. Horses hooves need to be trimmed on a regular basis to keep their hooves from getting too long. Hooves that are allowed to grow for too long without being trimmed by a farrier can result in severe deformities your horses feet and legs. When SHTF, it could be difficult to find a farrier, so you may want to gather supplies and learn how to trim and shoe your horse in an emergency now. You also need to pay attention to any pain, swelling, or heat in your horse’s legs as this can also signal leg issues that can be serious if not treated. Just like you and I, horses are often bothered by pests such as flies, bees, horseflies, and deerfly. Keeping your barn and stalls clean on a regular basis can help reduce the amount of pests your horse will have to contend with but it won’t eliminate them completely. You can also use fly spray to wipe them down, a head hood to protect their eyes from flies, or even a light blanket to help keep your horse protected against biting pests. Barns are also a haven for mice and rats. Make sure you put away any and all horse feed every single night not just to keep rodents away but to keep your horse from eating it too. Horses are a prey animal which means they will react very strongly to the scent or sound of any predators in the area. Pay attention to how your horse is behaving, they will sense a predator long before you hear or see one. Their first instinct will be to bolt and run. Predators include large animals such as bears, mountain lions, and even humans. Other animals that can spook a horse badly even though they can’t “eat” them, are snakes. If you are in an area where snakes are prevalent, be sure to keep a careful eye out for them. Just like any other animals, horses can get sick or develop a disease. Some are curable and others are not.. It’s important as a horse owner to know the difference between an illness that can be prevented completely, one that can be treated with the right plan, and a disease that will run its course and is going to end in death for your horse. With the right basic training and supplies, you can give your horse basic shots and perform other basic first aid for your horse that can help get them through a bad situation. In most cases, the quicker you identify the problem and act to treat it, the better the final outcome will be. • Colic is the number one killer of horses. A horse that eats too much fresh spring grass at once, or gets into the grain bin can colic. Tapeworms and other parasites can cause colic. Changes in amount of exercise or lack of fresh water can bring on colic. Colic involves gas buildup, a blockage, or a rupture in the intestines. It can be treated with success depending on the cause but in many cases it can also be fatal. • Strangles or Streptococcus equi is a bacteria which results in lymphoid tissue abscesses in the respiratory tract. It’s transmitted by direct contact with sick horses but also through horse equipment such as feed pans, water buckets, trailers, tack, sponges, clothing, or even insects. Be sure to have your horse vaccinated and notify your vet if you suspect exposure. • Flu in horses is highly contagious and is spread through direct contact with a horse that is sick or through a barn or pasture that is contaminated. Incubation is 1-3 days prior to symptoms which is why equine influenza is endemic (always circulating). Vaccinate your horses and quarantine any new arrivals to your farm for two weeks to help prevent infection. • Tetanus is caused by bacteria found in horse manure and soil. If your horse is wounded, and the tetanus causing bacteria, Clostridium tetanii, get into the wound, infection sets in. Get your horse vaccinated, keep stalls cleaned out and sterilized regularly and keep wounds clean to help prevent tetanus. • Rhinopnuemonitis or Equine Herpesvirus (EHV) is a virus which is contagious if your horse is exposed to it at a show, another barn, or vet clinic. There is a vaccine that can be effective but not against all strains. EHV is one of the reasons that new animals are often quarantined upon arriving or after traveling away from horse farms. Trailering your horse is a necessary part of life. The more comfortable your horse is with getting in and out of and riding in a horse trailer, the greater flexibility you will have. For example, if you do have horses and a natural disaster or other situation comes up that requires you to bug out in your vehicles, you need your horse to trailer quickly and without incident. A horse that won’t trailer or one who requires a lot of coaxing, not only makes routine trips with your horse a pain, but it can mean you waste precious minutes getting your family to safety if a natural disaster threatens your home. Many horses can be sensitive to changes in the environment around them even in normal times. When SHTF, it’s likely that the environment will be chaotic. Training your horse so they don’t stress out or bolt when you are counting on them to complete a task is critical in a survival situation. Most of this training will need to be done prior to a survival situation so that you are confident your horse will be reliable when you need them to perform. • Fire is something that can truly stress horses out. Their flight response kicks in and many horses panic. If a fire breaks out in your barn, it helps to cover your horses head with a hood or shirt before you try to lead them to safety. If you intend to use your horse when fighting fires, you’ll need to do additional training to ensure the are reliable and don’t throw you to the ground. 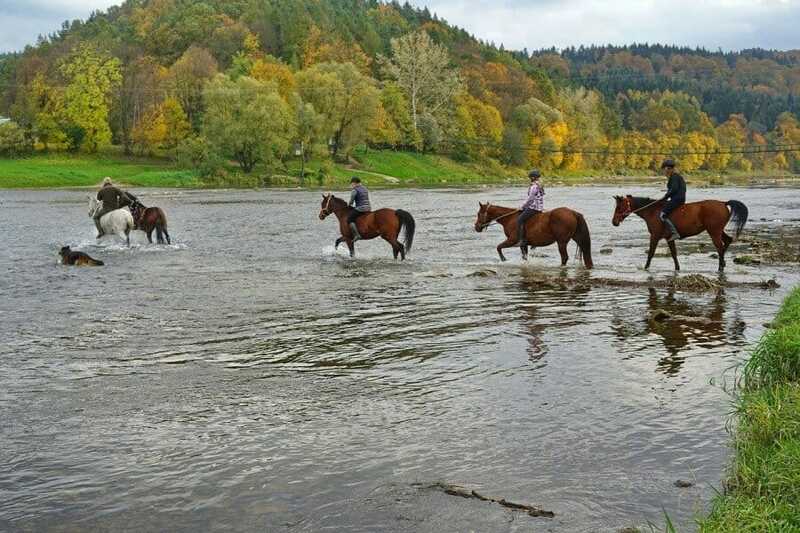 • Crossing water can be stressful for many horses, especially if they are new to the sensation. Practice leading your horse through shallow streams or creeks to get them used to build their confidence. Once you are confident in leading them through water, you can get them used to crossing with a rider on their back. During training, make sure your horse becomes comfortable in deep water as well as in fast moving water, especially if you anticipate needing to cross water during a bug out or survival situation. • Noise that is unfamiliar or loud can cause horse to bolt, rear up, or shy away abruptly. 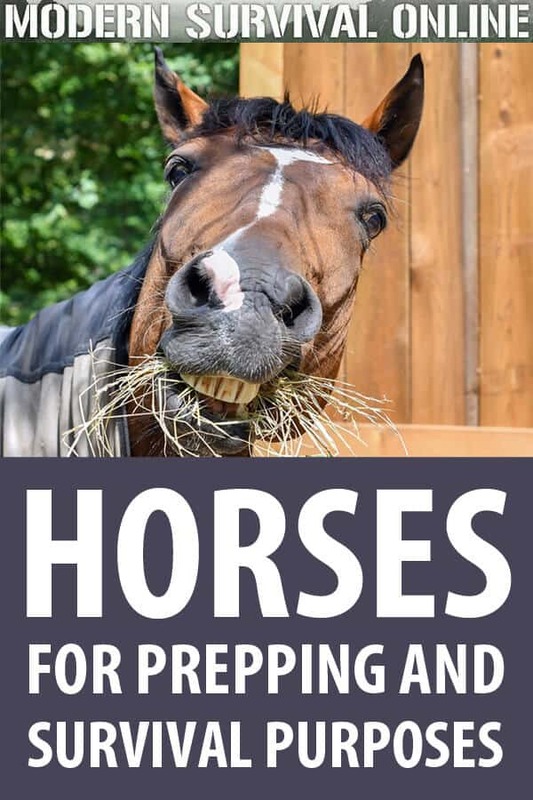 If you plan to use horses for prepping and survival purposes, make sure they are comfortable around a variety of loud noises including shouting, screaming, gun shots, loud horns, sirens, etc. • Blowing objects can cause even the most reliable horse to “spook” or “shy”. Horse may see clothes on a clothesline flapping, a plastic bag blowing in the road, or even a sign or tree branch waving in strong winds and it can cause them to suddenly jump sideways away from the item they saw. This sudden movement can throw a rider or in some cases cause injury to the horse if they suddenly move into oncoming traffic or something like a ditch or tree at the side of the road. • Extreme weather is something that can cause a lot of stress to some horses. It really depends on the breed and the temperament of the horse and how much experience with weather they have had. Younger horses may need more practice to be confident and not react. Ride your horse in the rain, heavy wind, and snow to get them used to dealing with weather conditions. • Leading (ponying) other horses is something that most horses can learn how to do without incident. There could very well be a time during a bug out or SHTF event where you need your horse to lead another horse. The ability to “pony” another horse can come in handy if you need to use a pack horse or have a 2nd horse carry a young child or elderly rider who isn’t as skilled in maneuvering unfamiliar terrain. • Opening/closing gates is something that you’ll have to do routinely around the farm and homestead. It’s inconvenient to have to dismount every time to open and close a gate. But in a survival scenario (particularly a bug out), having to dismount to open or close a gate can waste precious time. Make sure your horse is trained to maneuver so you can open the gate and then close it without dismounting. • Mounting from either side is something that could be important during a survival scenario or bug out trip. Most horses become accustomed to being mounted from one side only. You’ll want to make sure you train your horse to stand still if you are injured or space is somehow limited, you can mount from the side that is easiest or accessible. • Being tied is something you would think every horse would just take to naturally. In the movies, the cowboy simply loops the reins over a post and heads into the saloon, right? Not all horses are as content to be tied in an unfamiliar place and without access to food and water. Make sure you practice tying your horse in different locations and walking away for a short time. In a bug out or survival scenario, your horse’s ability to stay put without getting stressed could be vital. • Carrying Double Riders. Murphy’s law basically says whatever can go wrong will go wrong. You need to prepare for this when it comes to your horses. If someone in your group is injured or perhaps you find someone injured along your path, you may need your horse to carry two riders instead of the one they are used to. Some will do this no problem. For other horses, training and practice will be critical. One of the best things you can do to train your horse is to teach it to follow leg and vocal commands. If you need to drop the reins to shoot at an intruder or if you are thrown to the ground and injured while checking the perimeter and can’t walk, you need to know your horse will follow your commands without reins. So now you have a more concrete idea of how you can use horses for survival as well as some criteria to consider when choosing the best horse. You also have a good idea of the care your horses will require if you buy one. Do you already have a horse that you are planning to rely on when SHTF? If not, are you planning to consider horses in the future? What breed or breeds do you have or will you choose and why? Share with us in the comments below. Great article…but…I beg to differ. Mules and donkeys are not stubborn. They are very intelligent equines who just happen to be very cautious. They have an extremely strong sense of self preservation. Horses differ in that they will usually react quickly to commands, mules and donkeys will first assess the situation and then act appropriately. Communicating in a way that the mule or donkey understands and it will realize you are the boss. Simply yanking on its lead and swatting at it will not usually result in what you want, but, if you effectively communicate as leader of the herd, you will get what you want out of the animal. Mules and donkeys will always remember how you treat them and will react accordingly I would much rather ride/work with my mules any day rather than horses…I trust my mules’ collective judgement and they trust me. Owning a horse is like owning a boat. Most people can not afford one. It takes lots of money and years of skill to handle horses without getting hurt. I never recommend horses to anyone unless they have time and money to spare.